Cut and unbend coat-hanger to give a single straight piece of wire slightly longer than the drinks bottle. File then end to a point. On one of the bottles make a small hole in the middle of the base of the bottle so the coat-hanger can pass through cleanly. Make a slight indentation in the cap to this bottle to allow the sharpened end of the coat hanger to sit in the indentation. Cover the sides of the bottle with foil ensuring that there is a break in the foil on both sides. The foil should only cover the flat sides of the bottle, leave a 10mm gap between the end of the foil and the base of the bottle. On the other two bottles coat the outside of the bottles completely with foil, again leave a 10mm gap between the bottom of the foil and the bottom of the bottle. Attach the wires to the two outer bottles pointing towards the inner bottle. 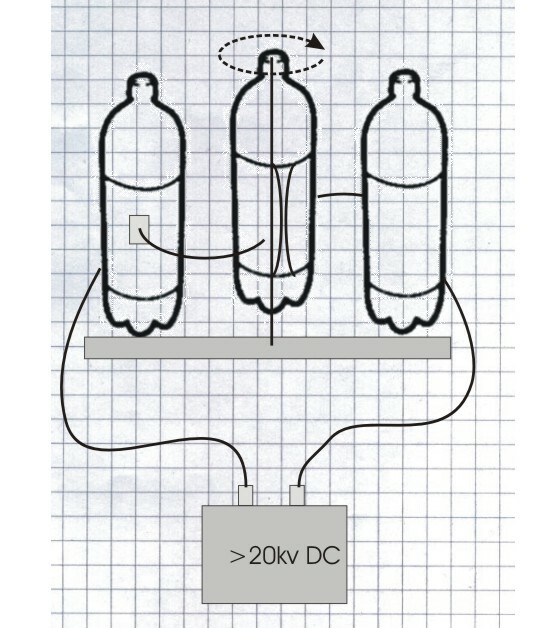 Stand the two outer bottles near, but not touching centre bottle with the wires pointing to the sides of the inner bottle. 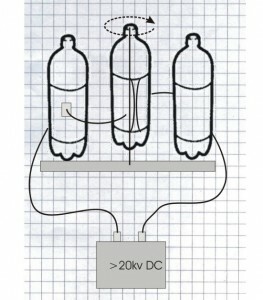 Apply a high voltage to the outer two bottles.